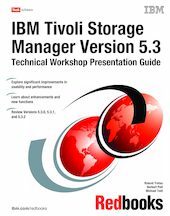 This IBM Redbooks publication presents an overview of IBM Tivoli Storage Manager Version 5.3. It is designed as a workshop presentation guide, and therefore uses presentation slides to provide descriptions about the changes made in the new release. This format enables you to easily gain a comprehensive overview and to quickly understand the new features of Tivoli Storage Manager. This book is intended for IBM Clients, Business Partners, consultants, and IBM and Tivoli staff who are familiar with earlier releases of Tivoli Storage Manager and who want to understand what is new in Version 5.3.0, 5.3.1, and 5.3.2. We recommend that you use this book in conjunction with the ITSO workshop, the book "IBM Tivoli Storage Manager Version 5.3 Technical Guide", SG24-6638, manuals and readme files that are provided with the products. This book is not intended to replace any information contained therein.